[AUTO](VC) Limit Break 4 (This ability is active if you have four or more damage):When this unit attacks a vanguard, this unit gets [Power]+5000 until end of that battle. [AUTO]:[Counter Blast (2)] When this unit is placed on (VC), you may pay the cost. If you do, draw two cards, choose a card from your hand, and discard it. [AUTO]:[Counter Blast (2)] When this unit is placed on (VC), you may pay the cost. If you do, draw two cards, choose a card from your hand, and discard it. Cookie has the modest 10,000 power, which is expected outside of the Tsukuyomi deck, is a Power Breaker and has a similar effect to another popular Oracle Think Tank card, CoCo, where when she's placed as the Vanguard, you can Counterblast 2 to draw two cards and drop any card from your hand. As such for the clan, Cookie helps provide, and even retain, that excellent hand advantage that they are able to do. Yes, there're the drawback of it being at 10,000, dropping a card and the mediocre Power Breaker effect, but the pure characteristics that the clan has can help balance out the negatives by being, debatably, the best defensive based clan in the game aside from maybe Angel Feather or even Genesis. As an added bonus or two, the fact that Cookie IS a Battle Sister helps the Legion and can hit at maximum for 26,000 thanks to Cream and her Power Break. 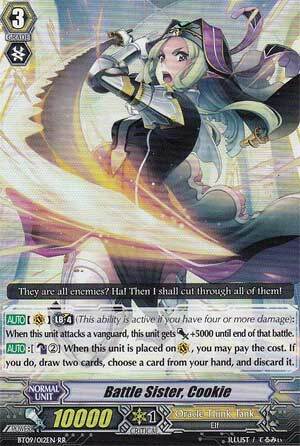 Despite its cons, Cookie is one of those cards where it will be provided useful until more support shows up...like the soon-to-arrive Magus series. Touted as the best backup unit to Coco, I'm not so sure about that. For CB2, you draw 2 cards and lose 1. Oh, and she gains 5k in Late Game. 1. Tsukuyomi can generate the same advantage for you as often as you like as long as its conditions are met for the same cost. Cookie only gets 1 shot at it, on ride. 2. You get no say in what you get compared to other cards like her owing to drawing blindly. At least Kiriel doesn't have this problem, mediocre as she is. 3. The third, and most prominent problem, is that the idea that she can 'back up Coco' is just stupidly wrong. I constantly have to explain to people that Sakuya is the better backup card. If you don't ride Scarlet, whatever backup you DO ride has to not interfere with Scarlet, or at least minimize the damage done. If you accept that whatever you ride has to not mess with her, it means you accept that you can't use Cookie because she costs the same as Coco, but her advantage engine is inferior. 4. Her ability to hit for more Late Game really isn't necessary when Coco can already do this paired with Gemini or Milk, and chances are you'll have one or the other considering the rate you're spamming draws. Combine this with Cream and you just get a flaccid combo; where's the soul to pay for the combo when Lulu's already emptied your soul? Sakuya's the secondary plan, if you must use the most boring OTT in the world. Just not Cookie. Please.